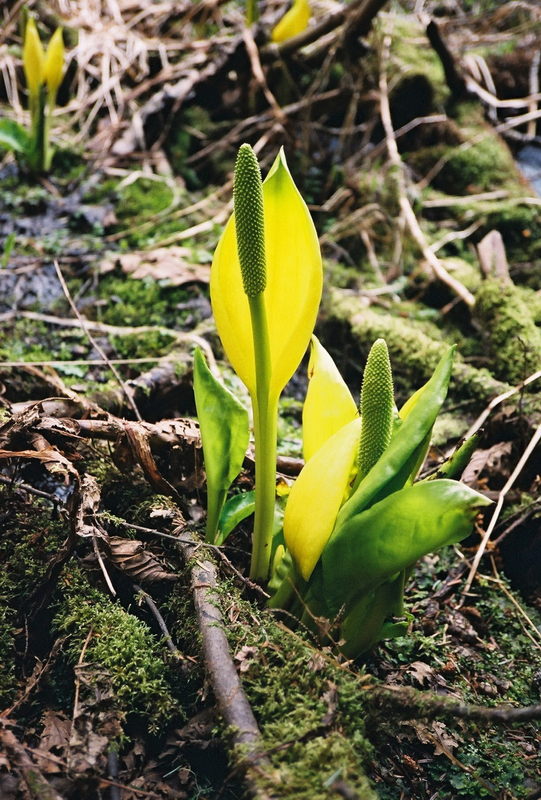 Spring is in the air and a magnificent plant known as yellow lantern, or skunk cabbage, is blooming along the West Coast of North America. This remarkable plant is able to flower when the temperatures in the far north are still hovering around freezing. Its habitat and physical characteristics make yellow lantern easy to recognize. Found in mid to low elevations, this native West Coast plant thrives in mucky, wet swamps near red alder, Sitka spruce and western red cedar. The physical and chemical features of yellow lantern—a member of the lily family—distinguish it from all other native plants. It has large green leaves with a yellow, erect column, about eight inches high, surrounded by a bright yellow sheath. It’s a precocious spring bloomer and has an eloquent sequence of events leading to flowering. Often the flower is 86 degrees (Fahrenheit) warmer than the surrounding air, with incredible energy, enabling it to easily punch through snow cover. These high temperatures occur because the plant oxidizes vast amounts of stored food, mainly fat, sometimes consuming in one day as much as a quarter of the total weight of the erect floral column. Some lilies, like the Easter lily, are very fragrant. Others are fetid. What’s so important about how a flower smells? Scent determines which insects will partner with plants and assist with pollination. Sweet-smelling flowers attract bees, wasps, hornets, moths and butterflies, while foul-smelling flowers mimic carrion, enticing flies and some beetles to act as pollinators. Yellow lantern, or its other name, skunk cabbage, aptly describes that it stinks! And along the West Coast it relies on rove beetles to assist with its pollination. The beetles are attracted to the smell, and when they land on the flower, they gorge themselves with pollen and other flower parts. After feasting and before leaving, some beetles even indulge in mating. When they land on the next skunk cabbage, they brush against the new flower, inadvertently passing pollen from one plant to the next or cross-pollinating. These highly evolved relationships within nature constantly remind ecologists how intricate, important and exquisite all life-forms are within wild forests. Yellow lantern berries are an important spring food source for ground squirrels and particularly black, Kermode and grizzly bears (in the far north), newly emerged and ravenous from months of winter hibernation. The Native Americans of the West Coast ate steamed parts of yellow lantern, but only sparingly. The plant contains a form of calcium that has sharp crystals, which cause irritation and burning sensations. The leaves were used as a ‘wax paper’ for lining berry baskets and steaming pits. The sight of this dazzling yellow lantern-like plant makes it official: Spring has sprung—from Alaska to California. Text © by Dr Reese Halter 2013. All rights reserved.